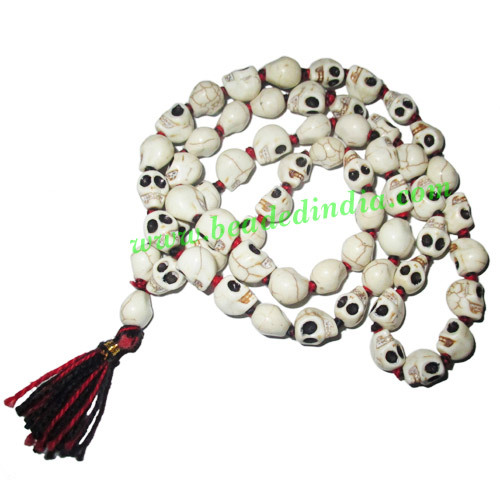 Skull (narmund, nurmund) beads string (mala), size: 10-12mm., weight of a string (mala) is approx 70 grams. One string (mala) has approx 54+1 beads, used for chanting, meditation and mantra siddhi etc. Silver Plated Headpin, size: 1.5 inch (38 mm), head size : 4x5mm, weight: 0.28 grams. Leather Cords 5.0mm (five mm) round, regular color - turquoise. Leather Cords 6.0mm flat, regular color - light violet. Leather Cords 0.5mm (half mm) round, regular color - lavender. Leather Cords 2.0mm flat, regular color - matian green.